Salafi Da’wah in 1996: A First-Hand Personal Account. This meeting was attended by the brothers involved in the da’wah, from around the country (and even overseas): Abu Aliyah, Abdul-Haqq Baker (Brixton Mosque), Faisal Malik (East London), Amar Bashir (East London), Abu Muntasir (Ipswich), Idrees Palmer (USA), a group from Leicester (supporters of Abu Muntasir), Abdur-Razzaaq San’aanee (of Somali origin and very active in the da’wah), al-Hidaayah Publishing (from Birmingham with strong links to Jamiat Ahl-e-Hadith), Abu Iyaad Amjad Rafiq, myself (Abu Khadeejah), Suhaib Hasan (as the chair), Abu Usamah ath-Thahabi (USA, Brixton Mosque, Ihyaa Turath), and several others. Abu Talhah Dawood (rahimahullaah) did not attend though invited. 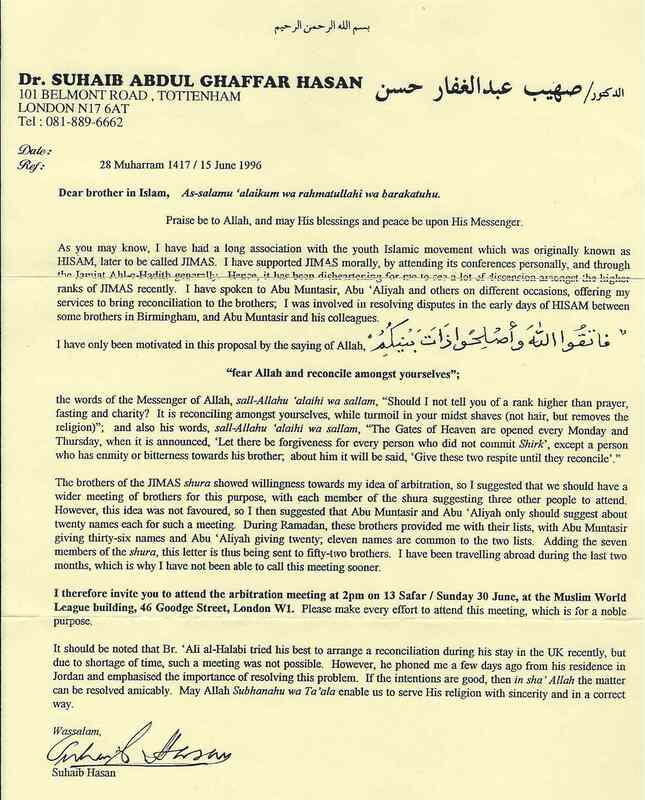 He chose not to meet with individuals who had clearly opposed the doctrines of ahlus-Sunnah instead he sent a letter, which Suhaib Hasan started reading but did not complete feeling it would not bring about his “desired resolution”. The letter in reality was a rebuttal of Abu Muntasir. On this day many of us came out vocally against the Abu Muntasir, so much so that even he did not think the opposition to his Qutubee/Surooree methodology would be so vociferous. He brought along with him Idrees Palmer as a support, yet even he was mute on the day. I had spoken with Abu Aliyah Surkhil extensively in the days leading up to the meeting, and he had assured myself and others that “this time” he would take a firm and vocal stance against Jimas and Abu Muntasir. On the day, however, he entered the boardroom, embraced Abu Muntasir before all of us in the meeting room and sat right next to him, and hardly said a word throughout the meeting, let alone against the Qutubist methodology of Abu Muntasir. In the following year or two, this behaviour of appeasement of counter-Salafi Creeds would become a trademark of Abu Aliyah and his handful of followers. There is no doubt that Abu Aliyah in his day had an impact upon the da’wah and he was much-loved in the early to mid-nineties, but as with many others of the era, they found it difficult to reconcile the Salafi Creed and Methodology with the realities of world-politics and upheavals that were taking place around them. These individuals had not travelled to seek knowledge, nor did they have much of a desire to do so; they saw their own opinions to be on par with the great scholars of the time, regarding themselves to be Mujtahidoon of sorts. Remaining steadfast and patient upon the truth is no doubt a challenge; some make it, others do not. We ask Allaah for steadfastness upon the Straight Path. The result of that “reconciliation” meeting at Goodge Street (London) was that Abu Muntasir and those with him became more entrenched, and we parted ways, permanently. Today Abu Muntasir is considered to be an opposer of the Salafi Da’wah and its ‘aqeedah and methodology.